Sun System® Diamond® low profile LEC® Brand 315 watt fixtures utilize cutting edge Light Emitting Ceramic® brand technology. State-of-the-art 95% reflective German aluminum interior offers unparalleled output, reflectivity and diffusion. The Diamond® LEC® Brand 315 has a Philips 50/60 Hz low frequency, square wave, highly efficient electronic ballast rated for 50,000 hour ballast life. Compact low profile design is ideal for tents for both primary and supplemental lighting applications. Power cord/plug configuration varies by fixture voltage. 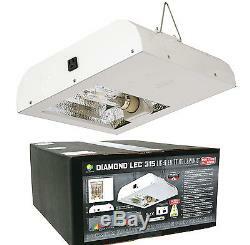 Includes Philips brand highly efficient agriculturally engineered CDM-T 315 Watt lamp that work in LEC® brand fixtures. This lamp creates amazing full color light spectrum out of next generation ceramic lamps. Higher amounts of beneficial UV and far red spectrums increase the lamps growth power to the plants. Very high 1.95 PPF per second light source (3100° K lamp). 3100° K color temperature, high 92 CRI, 33,000 initial lumens (105Lm/W). Long life 20,000 hour lamp. High 90% lumen maintenance at 8000 hr. High 85% PPF maintenance at 20,000 hr. Unique open rated lamp construction reduces radiant heat from the arc tube and is suitable for open fixture use. The 120 V fixtures have 1 on/off switch and 1 daisy chain receptacle. US Patent: DM/093,524 and US Patent Pending: 29/576,115. The item "315W Ceramic Metal Halide Sun System LEC Diamond 315 (3100K Bulb, 120V)" is in sale since Tuesday, July 11, 2017. This item is in the category "Home & Garden\Yard, Garden & Outdoor Living\Gardening Supplies\Hydroponics & Seed Starting\Grow Light Kits". The seller is "ashl_mcph" and is located in Fort Collins, Colorado. This item can be shipped to United States, Canada, United Kingdom, Denmark, Romania, Slovakia, Bulgaria, Czech republic, Finland, Hungary, Latvia, Lithuania, Malta, Estonia, Australia, Greece, Portugal, Cyprus, Slovenia, Japan, China, Sweden, South Korea, Indonesia, Taiwan, South africa, Thailand, Belgium, France, Hong Kong, Ireland, Netherlands, Poland, Spain, Italy, Germany, Austria, Israel, Mexico, New Zealand, Philippines, Singapore, Switzerland, Norway, Saudi arabia, Ukraine, United arab emirates, Qatar, Kuwait, Bahrain, Croatia, Malaysia, Brazil, Chile, Colombia, Costa rica, Panama, Trinidad and tobago, Guatemala, Honduras, Jamaica.